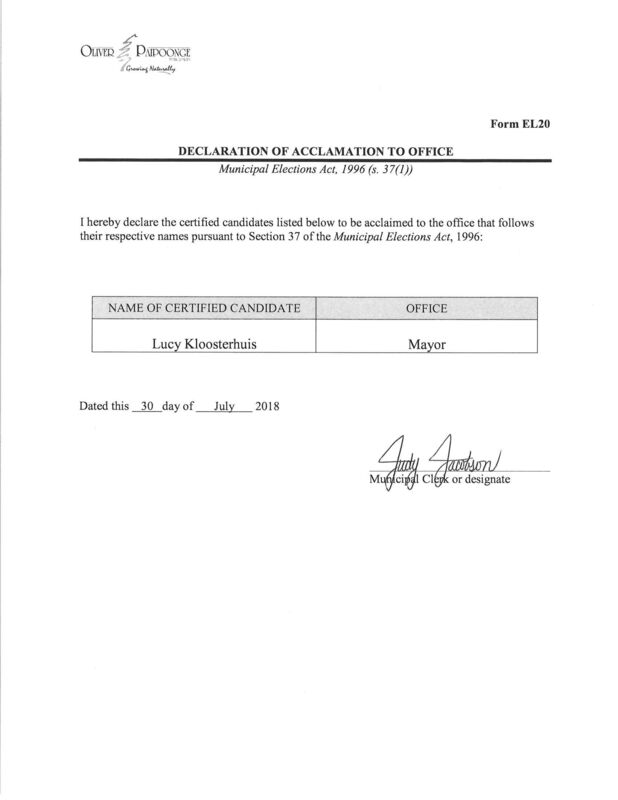 The Municipal Elections Act places responsibility on the Clerk to have regard to the needs of the electors and candidates with disabilities. The Municipality of Oliver Paipoonge Municipal Elections will be conducted in a manner that shall ensure that candidates and electors with disabilities have full and equal access to all election information and services. First day for candidates to file a nomination paper for the office of mayor, councillor or school board trustee. A candidate’s campaign period begins once their nomination paper has been filed, meaning they may begin accepting contributions and spending money on their campaign. Electors may submit an application requesting that their information be updated or that their name be added or removed from the voters’ list. Voting places will open at 10 am and close at 8 pm. Campaign period ends for candidates and registered third parties, meaning they cannot accept any contributions or incur any expenses. Candidates or registered third parties that wish to extend their campaign, due to a deficit, must file a Notice of Extension of Campaign Period, Form 6 by this date. Last day for all candidates and registered third parties to file a financial statement and auditors’ report for the reporting period ending December 31, 2018. Last day for those who filed a Form 6 to extend the campaign period to file a financial statement and auditors’ report for the reporting period ending July 2, 2019. 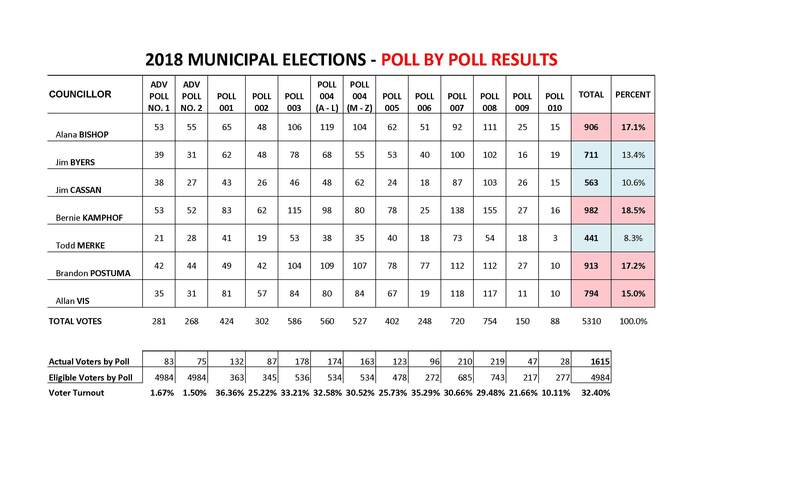 Municipality of Oliver Paipoonge to use the traditional paper ballot (composite ballots based on school support) voting method for 2018 Municipal Election. In order to be eligible to vote, you must meet the Qualification of Electors as listed in the Municipal Elections Act, 1996, s.17(2). is not prohibited from voting under subsection (3) or otherwise by law. Students are allowed to vote in both their home municipality and the municipality where they are attending school. The application to amend the Voters’ List will be available at the Municipal Office during the Revision Period commencing on September 1, 2018. The application must be signed by the applicant and filed with the Clerk by the applicant or by an agent. The last day for filing applications for revisions to the Voters’ List is October 22, 2018. 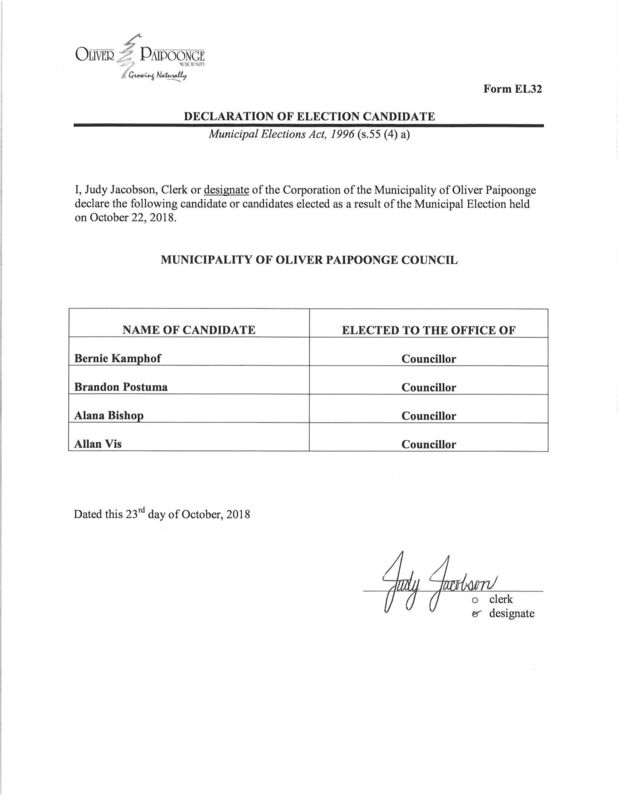 Voter Notification Cards will be mailed prior to October 1, 2018 to all electors in the Municipality of Oliver Paipoonge. The card contains your name, address, school support, poll number and voting location as well as advance voting dates and locations. You must bring your Voter Notification Card and IDENTIFICATION with you when you vote. If an elector is unable to attend the polls to cast their vote, they may appoint a person to vote on their behalf. Any person whose name is on the Voters’ List or who has been added by revision may vote by proxy. There are no limitations on who may vote by proxy provided they are on the Voters’ List. A person wishing to appoint a proxy voter must do so on the prescribed form – Form 3, Appointment of Voting Proxy, available at the Municipal Office. The appointment may only be made after the time for the withdrawal of nominations has expired for all offices for which the election is being conducted. The last date that appointments may be made is Election Day, Monday, October 22, 2018. An elector may only appoint one proxy, and the person appointed must be entitled to be an elector. A person appointed as a proxy may only act for one person who is not a relative, but can act as proxy for any number of relatives. The Clerk shall, if satisfied that the person who appointed the voting proxy is qualified to appoint a proxy and the person so appointed is qualified to act as a proxy voter, give a certificate in the prescribed form. Ontario's Municipal and School Board Elections are on October 22! Find out what school trustees do, how to become a trustee, how and where to vote, who is running in your ward or region and everything you need to know about school boards at www.elections.ontarioschooltrustees.org. Click here to access the "Making a Difference for Kids Guidebook".